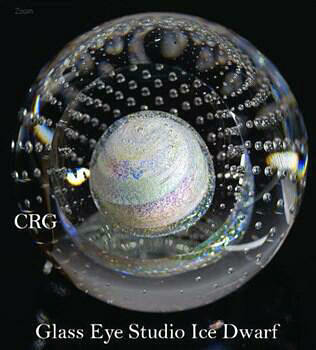 Glass Eye Studio's Celestial Ice Dwarf glass paperweight. Pale and lovely, cold and intriguing, the Ice Dwarf sparkles with iridescent dichroic soft blue and pink highlights. A real wonder of the Universe. Signed GES and presented in a blue velvet keepsake box with a story card with valuable information. Highly collectible. Approx. 3.0" diameter. Pluto is primarily made of ice and rock giving it the name of Ice Dwarf. There are 5 officially recognized dwarf planets in our solar system that are made up of ice and rock, they are Ceres, Pluto, Haumea, Makemake and Eris. With the exception of Ceres, which is located in the asteroid belt, the other dwarf planets are found in the outer solar system.